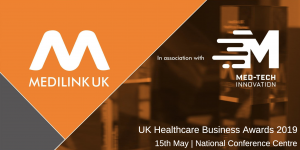 Homepage Uncategorised NeedleSmart have been shortlisted for the Medilink UK Healthcare Business Awards! The awards ceremony will take place at the National Conference Centre in Birmingham on the evening of the 15th May, 2019. It is set to be an exciting evening celebrating the outstanding business achievements, international successes and innovative breakthroughs made across the life sciences and healthcare technology sectors in the last year. The prestigious Medilink UK Awards, in association with Med-Tech Innovation, will be made up of ‘regional winners’ or ‘regional finalists’ from all of the Medilink UK regions, and will see over 200 industry professionals sharing their pride in the industry. The evening will see a total of 10 awards presented in recognition of a multitude of achievements and contributions to life sciences. To learn more about NeedleSmart and our product range, visit http://www.needlesmart.com or call 0151 124 4360 to speak to a member of the team. Follow us on twitter @needlesmart to keep up to date with the company and to see how we do on the night!